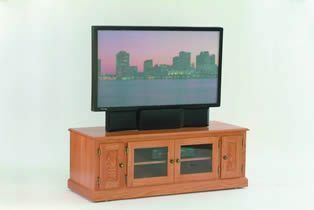 Just right to showcase your television, the Amish Berlin TV Stand is available in three styles and two sizes. Easily customize this living room furniture to match your style with room to store media and display your TV. The Berlin features four cabinet doors with shelving to line with your favorite movies and games. You can have your living room furniture just the way you want it. This Amish furniture is built by hand in Ohio and will last for decades. With so many custom choices, you can decide on the final look. We thank you for taking the time to shop DutchCrafters Amish Furniture. Email or call us today with any questions.